Vincent Battesti & Nicolas Puig, Terrains d’Égypte: introduction, Égypte/Monde Arabe, Terrains d’Égypte, anthropologies contemporaines, n° 3, 3e série (V. Battesti et N. Puig dirs), 1er semestre 2006, p. 11-22. See this volume of Égypte/Monde arabe journal. New: full text on the Égypte/Monde Arabe website’s on Revues.org: http://ema.revues.org/index1071.html. This issue of Égypte/Monde arabe journal documents different Egyptian fieldworks along different ways to approach them, which are as varied as the researchers who open them up.Its purpose is to present the writing of social anthropologists who have long resided and worked in this country. This issue therefore highlights different ways of approaching the Egyptian fieldwork and different ways of conducting the anthropological survey, winch are related to the idiosyncratic dispositions of researchers. We think that to be in favor of a form of anthropology that does not save the cost of the fieldwork goes “without saying”, for most anthropologists, but “without saying much” as long as the term “fieldwork” is not defined. This fieldwork is not only a geographical datum; the fieldwork — in French “le terrain” — is also its “development with a view to pursuing an activity” (Petit Robert, 2002), a singular activity of interactions with members of social groups. It is not limited to the anthropological place (“le lieu anthropologique” for Augé, 1992), it also includes preparation activities and preliminaries intended to provide access to the social milieux concerned: recognition, identification, delimitation and self-presentation. 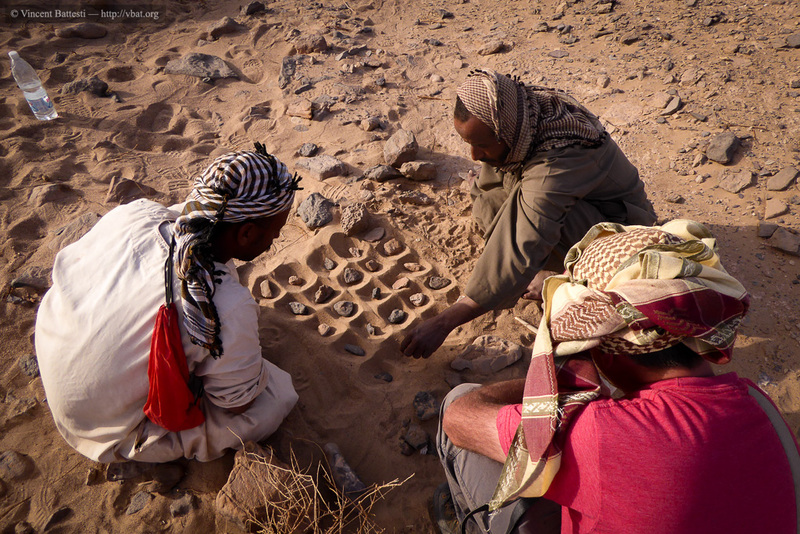 A social anthropologist (Vincent Battesti) on the fieldwork with ‘Abābda people, wadī Abū Ṣubeīra, Eastern Desert, Egypt, Feb. 2015 © Karin Harzbecher Spezzia. Terrains d’Égypte, Battesti & Puig (eds), 2006. This article has been read 9603 times. Dernière mise à jour de cette page le Monday 18 September 2017 à 15:21:36. //// -----> Citer cette page? Vincent Battesti, Nicolas Puig, "Fieldworks of Egypt: introduction" [en ligne], in vbat.org anthropoasis, page publiée le 29 January 2007 [visitée le 22 April 2019], disponible sur: http://vbat.org/spip.php?article351.